Singer The Weeknd and model Bella Hadid appear to have brushed off rumours of a split by stepping out together at a birthday party in Miami, Florida. Earlier this month (Dec15), the couple was rumoured to have taken a break from their relationship, with an insider telling E! News, "Bella and The Weeknd have taken a break. Their schedules got very busy and it really cut into their relationship." However, the stars appear to have put the gossip behind them by heading to a birthday bash in Miami together on Sunday night (27Dec15). 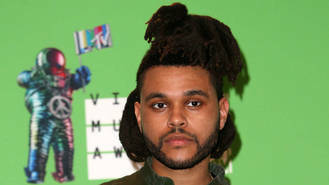 A source tells New York Post gossip column Page Six the pair partied at two clubs in the city to celebrate The Weeknd's manager's birthday. "They were having a good time. They partied until 7 a.m.," adds the insider. The Weeknd is in Miami ahead of a planned gig there on New Year's Eve (31Dec15). The Can't Feel My Face singer, 25, began dating the 19-year-old daughter of former model Yolanda Foster in the spring (15), and they reportedly spent the holidays apart. Bella previously credited her boyfriend with helping her through her battle with Lyme disease, which she has been struggling with since 2014. She told Britain's ES Magazine The Weeknd has been very supportive and "really good about me being sick". "I used to be the last to go home at a party, now I'm the first... This was my first full (catwalk) season. I was so exhausted... I only did 13 shows... The show girls do, like, 12 shows a day. I only did one or two shows a day and I was like: 'I need to go to sleep'." Tove Lo added to Golden Globes nominees for co-writing Love Me Like You Do. The Specials' John Bradbury has passed away aged 62. Shane MacGowan says The Pogues are no longer together. The Weeknd and Bella Hadid dismiss split rumours to party in Miami. Countless stars have come forward to pay tribute to late rock and roll legend Lemmy Kilmister. Motörhead's Lemmy Kilmister has passed away following an "aggressive" battle with cancer. Musician Hozier got used to speaking to terrified fans after posting his cell number online, because most of them couldn't believe it was really him. An unused theme song for the James Bond film Spectre by veteran English rock band Radiohead has been offered for free to fans. Frank Turner wanted his latest album to be "angrier" than his previous efforts. Kylie Minogue’s Christmas wish is to get on stage with Coldplay in 2016.